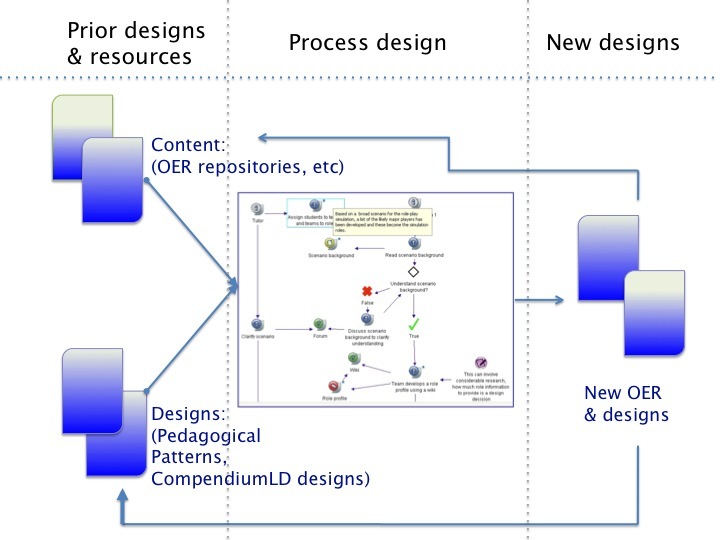 The follow diagram is intended to give a flavour of a design cycle for the design and resource of Open Educational Resources (OER). In the centre is a representation of the process of design. Imagine a designer is creating a new resource and mapping their design process in a visualisation tool like CompendiumLD. As they work through the design process they can draw on existing content (from say existing OER repositories) and designs (say from existing design repositories or pedagogical pattern repositories). The use these pre-existing OER and Designs to general a new OER and a new associated design which can then be deposited back into OER and Design repositories.